Treat hardworking hands to Neutrogena Norwegian Formula Concentrated Hand Cream, a nourishing formula that instantly comforts, hydrates and protects skin in even the harshest conditions. 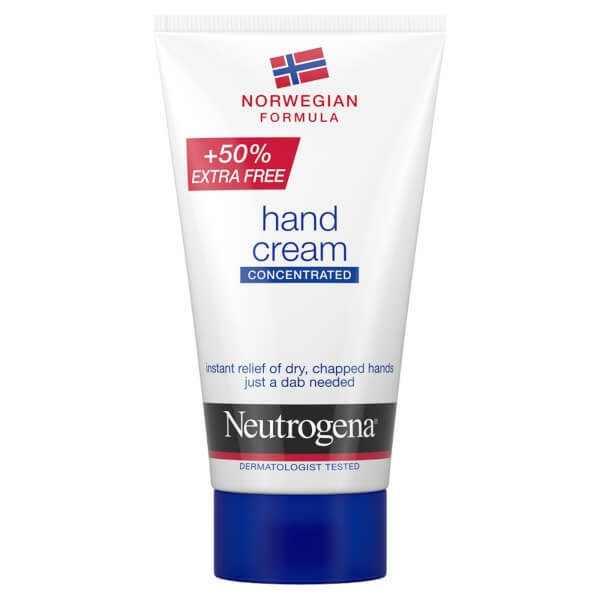 Enriched with 40% Glycerin, the concentrated hand cream effectively relieves skin dryness to leave hands feeling soft and supple. Its reparative properties protect and restore the skin barrier to ensure skin is nourished, moisturised and healthy. The concentrated formulation means only a dab is needed for ultimate hydration. Apply daily. Massage into hands. Aqua, Glycerin, Cetearyl Alcohol, Ethylhexylglycerin, Palmitic Acid, Stearic Acid, Sodium Cetearyl Sulfate, Sodium Sulfate, Phenoxyethanol, Parfum.